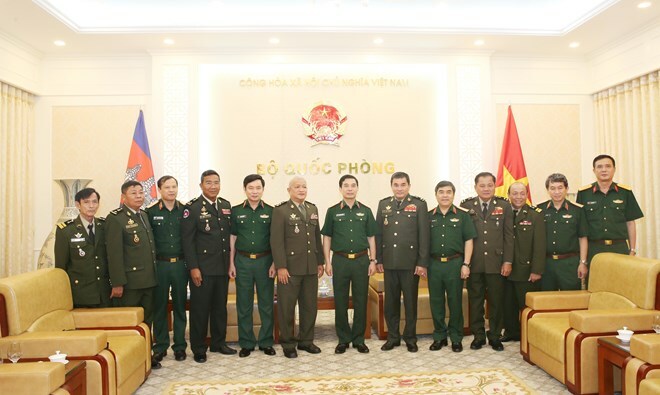 Hanoi (VNA) – Lt. Gen. Phan Van Giang, Chief of the General Staff of the Vietnam People’s Army (VPA), received a delegation of Cambodia’s Defence Ministry led by its Undersecretary of State Phuong Siphan in Hanoi on May 22. Giang emphasised that Vietnam and Cambodia are enjoying growing relations in all aspects, from economy, politics, culture, science-technique to defence and security, which is in conformity with the spirit of “good neighbourliness, traditional friendship, comprehensive cooperation and long-term sustainability” specified by the countries’ high-ranking leaders. Their defence cooperation has helped promote the military strength and build a regular and modern army in each country, while ensuring security, politics and economic and social stability in the respective nations, he noted. He said basing on the outcomes of the working session between the Cambodian delegation and the VPA Department of Schools, relevant agencies need to coordinate in addressing shortcomings in the enrollment and training of cadets and officers for the Royal Cambodian Army.